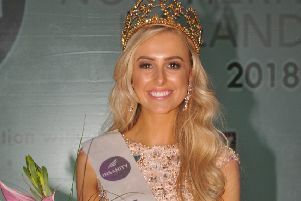 Multi-talented former Blue Peter presenter and model Zoe Salmon, who spent five years studying law and qualified as a solicitor at Queen’s University, Belfast, won Miss Northern Ireland in 1999 and has also competed on Dancing on Ice. The accomplished presenter, 38, who hails from Bangor, answers our questions. Chic, creative and fun! I love to wear dresses, especially midi or maxi. I like simple, clean lines and a little bit of sparkle either on the clothing or accessories. I enjoy celebrating the old with the new: so to put an individual twist on new purchases I love creating outfits from new pieces and mixing in pieces I’ve had for years and years. I’m far too sentimental so I throw nothing out which means I have three walk-in wardrobe rooms of clothing to wear! Every outfit has a special memory. It depends if I have a work project, wedding, holiday or I fancy something new to wear to the gym. I’m more of an occasion shopper and I love to do my shopping online because of the choice and the ease of being able to shop 24/7 around the world. I’d rather not say what I can end up spending, especially if it’s a month when I’ve bought a Birkin! Do you prefer to shop in high-street, designer, or independent shops? If I see an item and I love it then I don’t mind where it’s from, I have no preference. My wardrobe is a mix of everything from designer to charity to custom made. Although I do tend to buy clothes in America, some of my favourite pieces are from local designers and independents. If I’m not working then 5-10 minutes in the morning but if I am working then at least three hours because of my hair and of course make-up and styling. An evening look would take at least three hours, again mainly due to my hair! In the day I will gently cleanse and use only an eye serum and face serum and/or SPF if I’ll be outdoors. If I have a special occasion or I’m on screen or hosting an event then my morning regime includes a face mask and I also love the little eye masks - I’ve been using Timeless Truth masks lately. At night again I’ll cleanse and use an eye serum but I will use a more intense form of moisture on my face, a face oil or an overnight mask. I have several options and I love to alternate between them. I always lather on hand-cream before I go to bed. I love trying new products and if a new product is launched and I think it might work for my skin then I’ll give it a go but generally speaking I don’t regularly buy any item in particular. I generally prefer to leave the house makeup-free and I only wear makeup on days when I work or for some social occasions. I prefer not to wear make-up as I just love the look and feel of a natural, fresh face and that my skin can breathe. I grew up with severe acne and I was constantly trying to hide my skin and face so it’s like a small miracle to me that I’m no longer trying to hide my skin. I believe that health and beauty starts from within and I am very passionate about your health being your wealth. So as long as I’m aiming for those eight hours sleep, drinking plenty of water, eating pure, natural whole foods and exercising then my mind, body and I are happy. Some of my favourite ever outfits were worn by my mum so it has to be Priscilla Salmon. She had such an incredible sense of style and elegance that many people admired and still talk about today which is so very lovely to hear. She is my ultimate style icon. What is your top beauty/ fashion tip? Be yourself and wear/do what works best for you. For me I love drinking distilled water and eating pure, natural whole foods, I really do believe in the saying you are what you eat.